110 Creations: Is it pool weather yet? It's not quite time to hit the pool yet in Indiana, but I can tell it's coming soon! I've got swimsuits on the brain, thanks to a few random sunny, window-open kind of days. I know what you're thinking: Beth, you're 32 weeks pregnant, doesn't that throw a wrench into your spring and summer swim plans? Or maybe you're remembering last year when I made a Bombshell swimsuit and ranted about it. I have answers to both of those questions that nobody asked. In case the opportunity arises for swimming before my due date, I'm currently testing the Bahama Mama swimsuit from Peek-a-Boo Pattern Shop. The non-maternity version is out now (tankini and boyshorts sold separately so you can mix and match as Amy adds more swim patterns) and after testing there will be a maternity add-on pack. I have to tell you, this suit is coming along amazingly, and with a surprisingly low amount of curse words. Much easier than the Bombshell. I can't wait to show it off! Most of the public pools around here won't open until Labor Day, or after my due date. Last summer AB and I could frequently be found poolside in a nearby state park, while my husband mountain biked. I'm dying to get back to the peace and quiet of the 2 foot toddler pool, sun shining, nothing but trees all around...happy sigh! Even if you add a newborn to this scene, I'm still looking forward to it. And part of the fun is having a zillion swimsuits to wear! 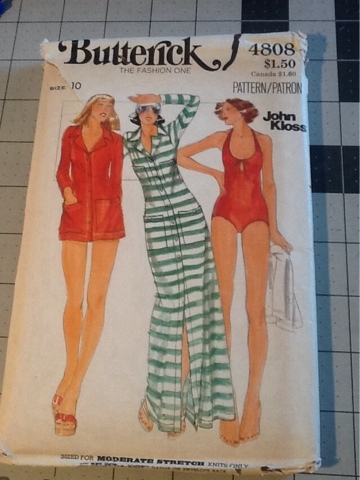 I picked up this vintage swimsuit pattern on ebay a few weeks back. I LOVE the cut on the leg, and also the back. I haven't purchased the pattern yet, as I'm having a hard time getting past the price tag for a single-view PDF. But again, I love the cut, especially of the bottoms. Anything that gives plenty of booty coverage (without being high-waisted) makes me happy, and the unique top would be so fun. Not to mention nursing-friendly, though I doubt that feature was what they were going for! 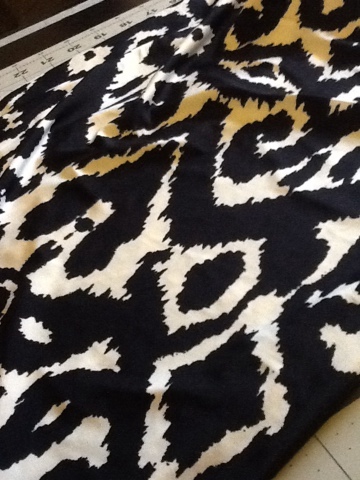 When it comes to fabric, I'm hoarding two special pieces. 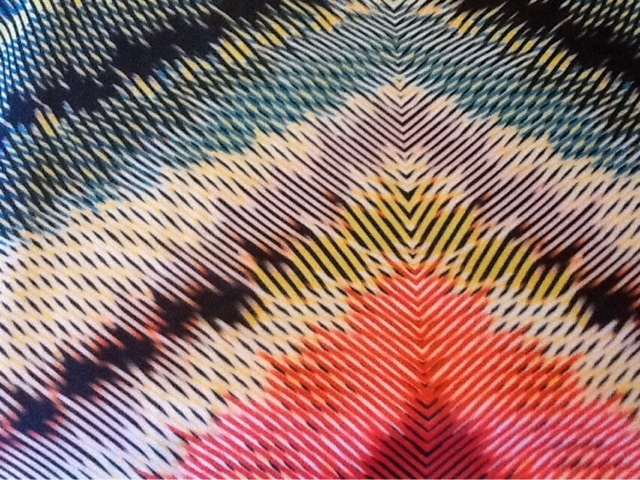 One I've had since last year, from The Fabric Fairy. 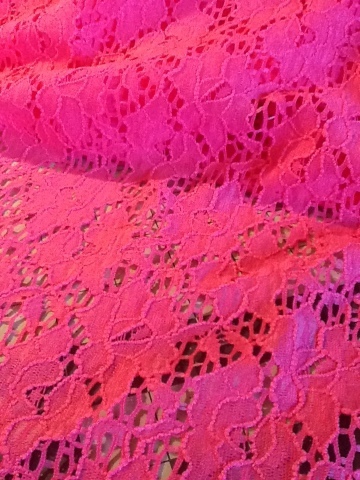 Yes, friends, this is a neon pink stretch nylon lace. Commence swooning. I have some neon pink lining in the mail to me, but I'm dying to make this in to some sort of paneled suit so I can play with lined/unlined sections. Kinda like this suit from Nordstrom's that I found via Pinterest. Am I the only one with swimsuits on the brain? I'm not going so far as to say that they're easy to sew, but they are fulfilling and MUCH cheaper than buying RTW. Any other patterns I should check out? OMG! 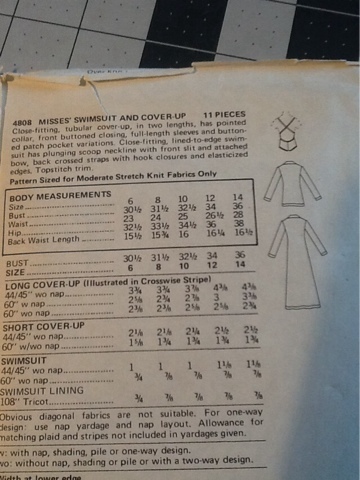 I spent yesterday evening swearing at Simplicity 1374 but getting wearable bottoms in the end (view C). Today I'll muslin the top and one top from M5400. Sigh. I do like the Named bottoms - well, the idea of them - but the crotch is unflatteringly wide on the model and that twist detail isn't hard to achieve. The top is cute but would never work for me. I have some fun teal and black polka-dot fabric and seeing how little a suit takes, I think I'm going to make a tank and bikini top and one pair of bottoms to have two suits! Yay! I think I'm going to spring for a Fabric Fairy Bonanza box soon! I cannot wait to see what you do with that gorgeous pink lace. LOVE it. No swim suit sewing for me. The closest I come to swimming is cooling off in lakes while backpacking, running shorts and a tank work for that, so alluring, haha!